"Download and Install VoiceGear Skype Gateway Software"
1. 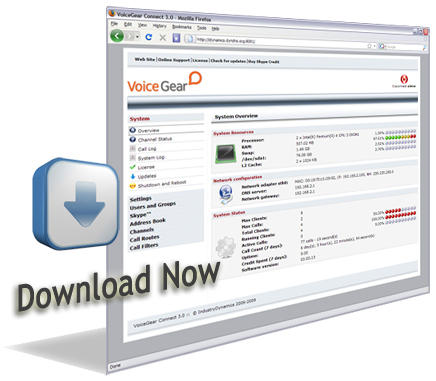 Download and install VoiceGear Skype gateway software full version with trial license. 2. Trial license provides you with full software features, and unlimited use. The following limitations are enforced with a trial license: max 2 concurrent calls, up to 3 min call duration. 3. You can use the full software with trial license for unlimited time, absolutely for free. 4. If you need to evaluate VoiceGear Skype gateway software in your company at full capacity, you can request a full 30-day license, absolutely for free. 5. Once you are completely satisfied with VoiceGear and ready to start realizing the full savings, you need to purchase a full permanent license. 6. After purchasing a permanent license, there is no need to reinstall the VoiceGear software. Simply apply the new license to remove all limitations. Download and install VoiceGear Skype gateway software absolutely FREE! Install VoiceGear Skype gateway software in 30 min. Request a demo license to remove all restrictions for 30 days. You can even win your full license for FREE! Like it? Purchase a full license to remove all restrictions.